Originally published in the Ustinovian magazine, 12th November 2017. A catch up with our visitors from Uppsala University, Sweden. Living in the bubble of college life, it isn’t hard to become a bit detached from the outside world. 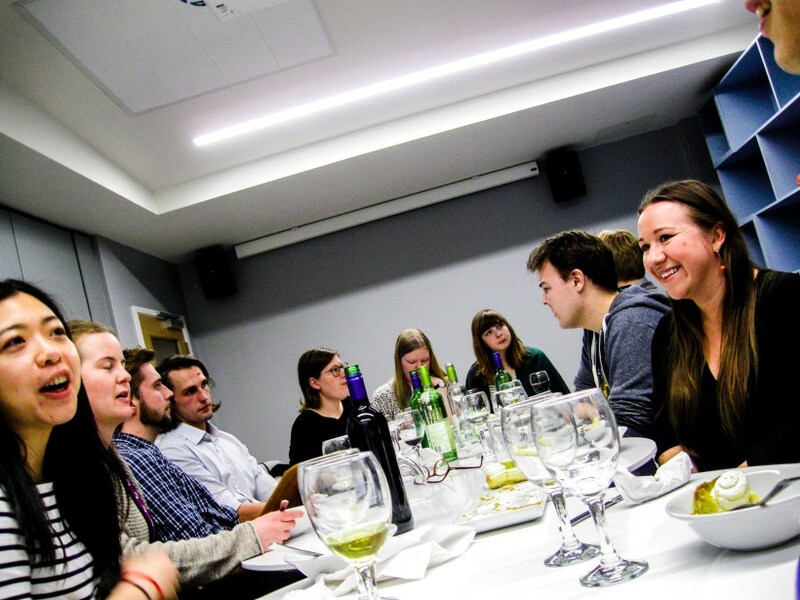 Here in Ustinov, we like to be that bit more engaged with what’s going on outside of our own community, reaching out to those not just beyond the university but beyond the borders of the UK. Last week, we welcomed a team of students and academics from Uppsala University in Sweden. The aim was simple; to continue building strong relationships between our two institutions, and learn about and from one another. I was able to join four Uppsala representatives to learn more about their Nations’ system, and found that how it works isn’t at all unfamiliar. Anna Liv, who works in the communications department at Uppsala, Sakke, their alumni co-ordinator, Sofia, the communications co-ordinator and student Karin graciously allowed me to interrupt their welcome dinner to fill me in, between bites, on the workings and the history of the Uppsala Nations. “The Nations are entirely run by students,” Sakke explained, “but there are main people working full time for the Nations, who are called curators- which has nothing to do with art!” When students come to Uppsala, every student joins a Nation which, historically, were named after different regions in Sweden and the students lived in the Nations which represented their district. When I pointed out that this doesn’t really seem an effective way of diversifying groups of students, Sakke was quick to assure me that this is no longer how the Nations are organised, adding “Usually now, you join a Nation that corresponds to your interests.” Already, similarities between the colleges and Nations were becoming apparent. The Nations also play an important part in setting up structures for those who cannot support themselves through means of scholarships, as well as helping their students build relationships outside of their academic courses. Sofia, who had remained fairly quiet throughout (probably enjoying her dinner!) told me “I think a lot of people chose Uppsala because of the Nations, because it makes us special and unique”, a statement which the rest of the group readily agreed with. She has really utilised her experience of the Nations by gaining a job through the skills which being a participating member has furnished her with. Karin explained how the 13 nations in Uppsala ranged from housing 200-8000 students which are ‘in many ways run like companies- but run for students by students. It’s nice coming and seeing a university that has similarities to Uppsala and see if we can make some connection and collaborate.’ Karin elaborated on this by explaining the relationship Uppsala has with ‘friend nations’, where they partner with Lund University and Helsinki University, partaking in yearly visits much like the one they made to Durham. “We have conferences to discuss different matters and drink.” Karin added, truly showing the unifying power of such visits! The Uppsala representatives received the full Ustinov experience, and ended their trip by joining us at our Bonfire Social. From the responses of the representatives, it seems that a collaborative relationship is well on its way to being formed, and that we can continue to learn from our friends in other Nations in the future.